As a child I always wanted to be a ballerina, like many other little girls. But it was more expensive than gymnastics so that’s where I ended up. Once I started college, I was able to take dance again and I realized that it was, in fact, where I should have been all along. Gymnastics was fun but it never provided the peace of soul ballet does, which is the most important reason on why I dance. I love the workout as well. Ballet also presents me with a well-defined set of goals (which are seemingly endless and unattainable at times) and a sense of accomplishment. Ballet is so all consuming; when I dance the rest of the world goes away and all there is is the music, the movement and me. It’s the best “drug” I know of — an escape, a panacea for my soul, so to speak. I pray I will never have to find out what life would be like without ballet. So why do I dance at Maple Conservatory? The facility is great, the support amazing, but mostly the incredible teachers. I don’t think there’s anywhere else I could go and find such an accomplished staff with their level of expertise and experience that truly care about their adult students and their desire to improve and succeed. I doubt there is anywhere else adults could go and learn from teachers who are familiar with the world’s greatest training curriculum and who give such great tips and corrections. We are truly blessed. Thank you for the Maple Conservatory and for helping us keep our ballet dreams alive! 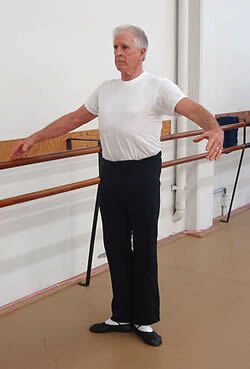 Why does a man in his late 70’s take ballet? As I twirl…more accurately…careen across center floor, my arms quasi-extended like twigs on a plumb tree. Both male and female younger dancers scatter ahead of me as leaves before the wind. I can hear my wife (a younger woman than I with some ballet training) moan audibly with embarrassment from behind the observation window. “Why do you do it?” she asks me on the way home, forgetting that she has asked this question 50 times before. I answer as always, “Because it’s there.” I can tell by the blank expression on her face that, as usual, this answer is unsatisfactory. So why do I do it? Perhaps it is because, as I have become older, I have pondered more closely those things that are important to me. High on the list are health, friends and beauty. One correlate of health, of course, is the ability to move. This ability for me, I sense, has become under serious attack as the years progress. Whether it’s a loss of muscle tissue, nervous connections, or joints that harden and lose their range of motion, the end result is a slippery slope down which my body seems to slide towards a point of immobility; a point on earth that resembles more and more that point of singularity in the black hole at the center of our galaxy from which there is no escape. Well, if we can’t escape, we may be able to dawdle a while before we get there. “But how to do it?” that is the question. A big piece of the answer comes to us in an old adage, which is particularly applicable to nerves and muscles, “Use them or lose them!” In other words, we need to exercise. But random attempts are not sufficient for this daunting task. We need a well thought-out, comprehensive system…one that challenges all the muscles of the body; that stretches all the joints including the spine; and that pulls the body up and away from that point of singularity. But haven’t I just described ballet? Yes, I could do weight lifting, Pilates or yoga, but for me, ballet incorporates all the moves I need and more. Along with ballet, come the other values I hold so dear—beauty and friends. There is the beauty of great music played by artists of amazing skill. 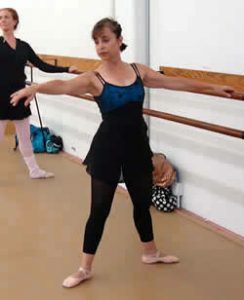 There is beauty in observing the teaching process as the ballet masters skillfully share their hard won knowledge and creativity with others, who learn and perceptively improve. There is the beauty of healthy people of all ages moving symmetrically through space in time to the natural rhythm and the symbolic meaning of the music. Invariably, these people share a bond of common focus, purpose and enjoyment, which generate an underling a feeling of friendship. In turn, they are gracious in accepting less capable. Dance is magic. You can dance in beautiful melody such as waltz, tango, etc. and imagine you are a princess dancing all night. You can jump and feel like a bird flying in the sky so free and you can turn like a rolling stone, so powerful and speedy. Ballet gave me a colorful and happy childhood brought me pass through difficult teenage years and even now, I can forget all my distress and frustration while I am dancing. As an adult student now, I always thought how lucky I am. I am still dancing on the floor and still learning in the class. Every time I come to class I find something new, something different in the routine, even though they are the same steps and the same elements. I have been in Charles Maple’s class for a long time. Charles is the most wonderful teacher I have ever met. He taught me and urged me to get better and better. For that I am deeply appreciative. He teaches students with passion and patience. His instruction is so clear and precise. In his class, there is always full of fun and cheer. I would like to say that as a ballet dancer, life has become beautiful and joyful. God in His kindness, goodness and mercy has given me the chance at this senior stage of life to now have the wonderful teaching of ballet that I so desired when I was 12 years old. I grew up in Long Island, New York until I was16 years old. I started taking ballet at age 5 and by age 12 I began begging my parents to further my skills, wanting to take class from André Eglevsky. We had only one car and my mother stayed home. I’m very reminiscent of those days, being one of three children, not being allowed to travel on the bus alone that distance and financially it was not possible, you see, so dancing was not an option at that time. I stopped taking class until we moved to California. At 17 or 18 years old I was able to pay for my own lessons and I returned to dancing under the teaching of Lila Zali. I loved every minute. But by then, I was too old and not having a ballet body of any type or height; just an unquenchable passion to improve and dance to the best of my ability. I continued to take classes while raising a family, stopping here and there as the family needs came first. Now, after 30 years of marriage my husband and I are empty nesters. Through the years, God has opened the door to use the abilities He has given me, and I have gone on to direct, produce and choreograph many musicals, skits and other things for the youth ministries and women’s ministries at my church. I am thankful to take my passion for dance and use it for the glory of God. At the age of 21, I gave my heart to Jesus. He is the real passion of my life and He’s given me the chance to make my dream come true with the fabulous teaching at the Maple Conservatory. Thank you so much for the adult classes. I am truly blessed. Thank you, and God bless you. I started dancing, like many adults, at a very young age. We lived in LA and my mom worked full-time, so a van from the ballet school would actually come to our house and picks me up. She did it primarily to keep me occupied while she was at work, and also as a form of “charm school” to help me rid of my awkwardness and tomboy ways. In fact, she got really serious about having me go to ballet when I decided to join a Powder Puff football league. I have no sisters, just two brother and a sports nut dad, so I thought football would help me fit in with the boys. My mom felt otherwise and she was right. 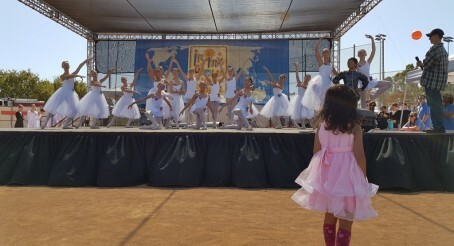 I started to fall in love with ballet when I was finishing sixth grade and getting ready to go into junior high school. And unfortunately for me, that was when my mom fell out of love with ballet. She was concerned that ballet was going to take up too much of my time for academics (maybe) and that it would make my thighs big (which just the opposite is true!). So she pulled me out right when many of the components — flexibility, port de corp, etc. — were starting to fall into place. The teacher even pleaded with my mom not to pull me out because I was one of her most promising students. It fell on deaf ears. I didn’t come back to dance again until my junior year in high school when I joined the modern dance club and fell in love with dance all over again. I ended up going to the Univeristy of California at Irvine for the dance program because I could finally make my own decisions in life (and in dance), but my mother was horrified and wouldn’t pay for my education. So I paid for college myself and graduated from UCI way back when Eugene Loring was still the Chairperson of the dance department. El Gabriel was there too and Molly Lynch was a grad student. I was put into remedial ballet when I entered college and bought my first pair of pointe shoes as an 18 year old college student because I had fallen so far behind in my ballet training. Now as a mature adult dancer, I’ve never let ballet out of my life again. I take as many classes as work (and family) permit and like [Conservatory parent] Wendy Coates, I made the Nutcracker a family affair. Both my boys were gymnasts when they were young so we did Nutcrackers together while my husband worked backstage hauling sets around. I especially love the Maple Conservatory because of the caliber of teachers for adult dancers. Charles and Tong are my favorite teachers because they know how to speak to adults about movement, placement, proper port de bras (which I’d forgotten from my early training), and you both appear genuinely pleased when we get even the simple things right. I appreciate that you push us, but you also keep the class more dance”-y” and expressive, rather than too academic. I hate classes where the teachers are so academic and the movements so static that by the time you get to center work and you’ve hardly moved from where you began. We adults have so much less natural ability than kids & teenagers who can be shaped and molded. It takes a special kind of a teacher to be able to teach adults because we’re not very inspiring to look at. But among the few who genuinely like teaching adults (like Charles, Tong, Rosemary McCarter and Paul Maure), the excitement and joy they exhibit in watching us dance makes us want to dance even better. I don’t know what they are seeing, but it comes off to us that they like what it is and we’re grateful beyond words. To me, an adult who loves ballet, dancing for a teacher who enjoys working with adults is like the feeling of love returned to you. That’s the Maple Conservatory’s adult classes (and just a tiny handful of other studios). I’m sure my family and friends consider my fascination with this art form a definition of who I am. But the reality is that dance has meant different things to me at different times in my life. As a young child, and very much an introvert, dancing gave me the opportunity to express myself without verbally communicating with others. As an adolescent, my enjoyable hobby turned into an obsession. I was driven to take classes everyday in an effort to improve but I finally faced the fact that dance would not be one of my professional pursuits. As a young adult, struggling with a weight problem, it provided me with a pleasant form of exercise and an avenue for restoring my self-esteem. In middle age I developed a hip problem that sidelined me from the ballet studio for approximately two years and I resigned myself to the fact that my dancing days were over. I took up walking, swimming, and working out in the gym, but somehow these activities did not feed my soul the way that dancing had done in the past. Intensive physical therapy and my introduction to Pilates provided me with pathways that allowed me to return to the barre and the friendships that I had made in the ballet world. To be dancing now, as a senior citizen, is truly amazing and it brings me nothing but pure joy. It is a wonderful workout for my body and mind and it is a complete departure from my job as an elementary school principal. As I stand in the corner of the room waiting for my turn to move across the floor, I look at the conservatory dancers in front of me and I try to imprint their images in my mind so that I might replicate their timing, head placement and nuances of style. When it is my turn in the queue I join my group. My heart beats with a rush of adrenaline, the connections in my brain snap and crackle as I struggle to remember the intricate combination, my body tenses, ready to execute the technical demands, and my senses absorb the music as I wait for the perfect moment to launch out into time and space. Dancing reminds me of a fireworks display. Those rockets that are most spectacular soar into the night sky, pause for an instant and burst into the air with a plethora of sounds and colors. The audience gasps in delight and then realizes that the magical moment has passed, not to be repeated. At other times during the night there is an occasional rocket that streaks into the sky but instead of exploding with vibrant sounds and colors, fizzles, and drops soundlessly into the darkness. Taking my preparation to execute the combination, I hope that I will be able to bring everything together in perfect harmony: technique, musicality, stage presence, and emotion to replicate the brilliance and energy of the successful rocket launch rather than the one that fizzles and flares out. When I hear Charles shout out “delicious!” or “I’ll buy that!” I know that I have succeeded, and I race back to the corner to try it one more time. And so, there you have it! These are wonderful and inspiring words from some of our adult students who love to dance. If you ever wanted to begin learning ballet, I guarantee that you can still learn to dance ballet beautifully, no matter your age. We will teach you! (Though we can’t guarantee that you will become the next principal dancer of the New York City Ballet or American Ballet Theatre.) Dance is a language, and ballet has a very specific vocabulary from which you can learn on many levels — from the intellectual, to the purely kinetic. The interesting thing about ballet is that the range in your dancing is only limited by the range of your imagination. Even if the physiological realities are most visible, think of the beauty contained in a simple gesture of a dancer’s hand in simple a port de bra. The possibilities are limitless. At the Maple Conservatory of Dance we offer a strong adult ballet program and we care about our adult students and understand their passion to dance. We know that the dance is in all of you and our top-notch faculty has the professional background to help you bring it forth into the real world. If you are itching for a class, today is the perfect day to begin. The journey begins with your first step.